In the second half of the Bollywood romance "Dilwale Dulhania Le Jayenge", after Simran's grandmother expresses concern to her son (Simran's father) about her granddaughter's apparent lack of happiness, there is a scene where Simran's mother is carrying a tray with small bowls of kheer around during the engagement celebrations, and asks her husband if he would like one. He accepts and they pass a very brief few words about whether Simran has gotten over the boy she fell in love with in Europe. The father ends up threatening that she had better have gotten over it or she'll regret it. The recipe below is based on a recipe on Veg Recipes of India and a recipe from food.com. Bring the 2 Cups of milk to a boil & then add in the soaked rice. Simmer uncovered, stirring occasionally, for about 30-40 minutes or until the rice is very soft/falling apart & the mixture is like porridge, thickened & creamy. 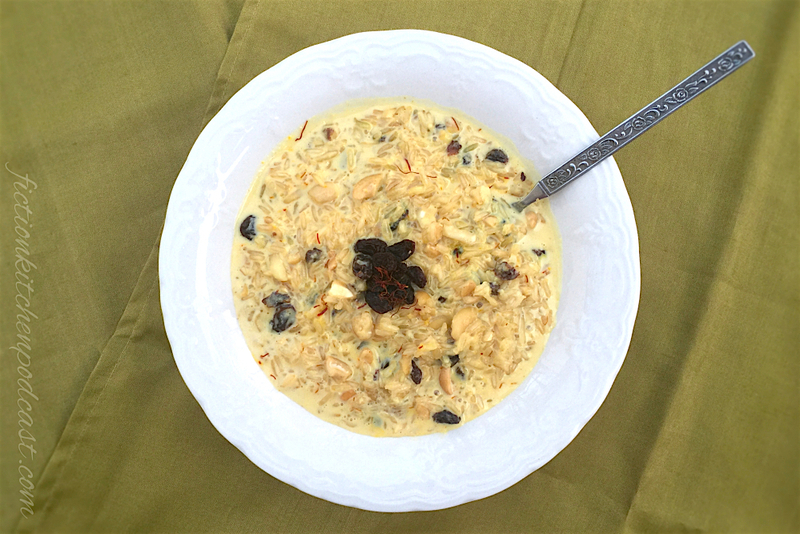 Stir in the condensed milk, starting with 1 tablespoon & adding more if you'd like the kheer sweeter, plus the saffron & cardamom. Lastly, add in the optional nuts, almonds, & raisins. Serve warm or chilled. Both ways are yummy!